What’s the word for that again? You know. When guys are happy, six of them scoring in double figures, when you have a season-high shooting percentage, a whopping edge in rebounding and a high number of assists? You know what I mean, when you score more points than the other team? Oh, c’mon, what’s that again? Oh, right. Thanks. A win. Yes, the Bulls got one of those Saturday against the Cleveland Cavaliers, 100-84, and they’d come so rarely of late that you wondered whether the Bulls were going to get another. The larger question, though, was whether you’d have enough guys. Luol Deng, Jimmy Butler and Kirk Hinrich were out injured Saturday along with Derrick Rose, of course, who is out for the season. That left the Bulls being led by Augustin, who was released by Toronto after not even playing in nine of the previous 12 games there. He was thus joined in the backcourt in the Bulls’ 13th different starting lineup this season by rookie Tony Snell along with Mike Dunleavy, Carlos Boozer and Joakim Noah. So what’s holding you back, guys? 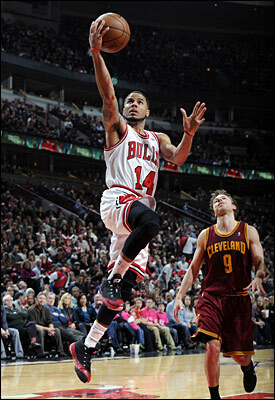 Not much this time as Boozer was clutch with 19 points and nine rebounds in just 30 minutes. And despite an exceptionally short rotation and Augustin playing until the Bulls led 100-83 with 1:36 left and cramping along the way as a result, Augustin had his best game in almost two years. Snell was five of eight on threes as the generally poor three-point shooting Bulls made 10 of 15. Taj Gibson added 15 points with the rest of the bench playing a combined 18 minutes and Joakim Noah equaling a season high with 18 rebounds, three fewer than the entire Cavs starting five. Noah added 11 points in just 31 minutes. It’s been a long time and it was the 10-16 Cavs in the second of a back to back. Of course, the Bulls are the same 10-16 and lost to the Cavs late last month as Andrew Bynum took it to them inside. And the Bulls have played plenty of team lately coming in on the second of a back to back and seemingly undeterred. But this time Noah played Bynum stronger, pushing him a bit farther out and giving up the jump shot. He’s not beating you that way. When Bynum got any sort of deep post position, the Bulls brought a quick double team off the opposite big man. Thus they didn’t drop off the perimeter this time and made Bynum’s shot difficult. Bynum had 19 points and seven rebounds. But he was not a major factor in forcing the Bulls defense to scramble. So Kyrie Irving had 14 points on five of 16 shooting as Augustin also did good work sticking to him and the Cavs didn’t get much else going offensively with Dion Waiters out with a wrist injury. But no one should complain about injuries around the Bulls. Noah equaled a season high with 18 rebounds, three fewer than the entire Cavs starting five. Noah added 11 points in just 31 minutes. Yet, the surprise for the Bulls was the offense, 100 points and at least 50 percent shooting for just the fifth time this season, better than 50 percent shooting for just the third time in the last 18 games and 100 points for the third time in the last 18 games. And much of that was due to Augustin, who pushed the ball and took quicker shots, rejecting the slow paced walk-it-up game the Bulls generally play that uses multiple pick and rolls until there are a few seconds left on the shot clock and you are ready to get up from your second nap while they have the ball. Yes, it’s music to your eyes to watch someone with an intention of scoring. Too often the Bulls don’t seem to, though you see the same hesitation in much of sport these days. Coaches have exerted more control in all team sports in the last decade or so as the coaching salaries have increased and, it seems, a greater justification to be more involved. So managers call every pitch in baseball from the dugout; football coaches virtually script the game as they even brag about having the first 25 plays planned out. It’s why I love Peyton Manning. He changes the play every down. Don’t listen to that guy. You don’t want to preach mutiny or chaos. But players know the rhythms of the game better than coaches do. Perhaps not on defense, where a system of play is more vital. But catchers are smart and quarterbacks are smart and they can see and have a feel for what works. Same with point guards. Augustin was a lottery pick for Charlotte in 2008, a little guy, maybe 5-10, who you can see knows how to run a team, has a feel for the game and can make a shot. He had some productive seasons in Charlotte, averaging 14.4 points and 6.1 assists in 2010-11. But he had a poor season with the Pacers last year and wasn’t playing with Toronto when the Bulls brought him in Dec. 13. 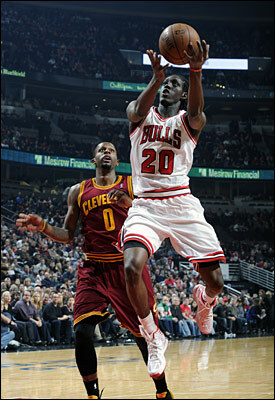 In the last four games as Hinrich went out with a bad back, Augustin has averaged 13.8 points and 8.3 assists. But more importantly, unlike Teague–and not to blame Teague because he’s not a veteran like Augustin–Augustin has played. He doesn’t stop and look for every play call. When he sees a break he goes. Thibodeau may still be calling a play. But the veteran guards know if they have an opening to take it. Augustin has been. He can get into the lane as well and is good as a passer with penetration. That enabled Snell to get open shots and 17 points, one off his season high. Snell, who isn’t shy about firing the three as he was two of 11 in Oklahoma City, made a couple of big ones in the second half. One was when the Cavs were within 10 late in the third quarter after the Bulls had led by 19. Another was with about seven minutes left after the Cavs got within 10 again. Though preceding each of those shots by Snell was a big play by Augustin. In the third quarter before that Snell three, the Bulls looked like they were about to blow yet another game with an ineffective third quarter as the Cavs got within 68-61 with 4:32 left. Bynum had a big quarter and the Cavs were on an 11-2 run. 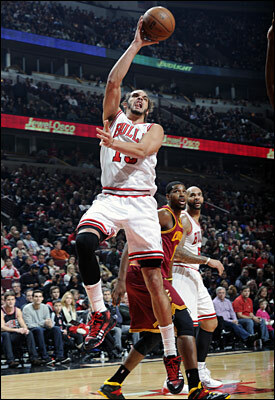 But Augustin took a crosscourt pass from Noah and extended the Bulls lead back to 10 without hesitating on a three. And then after the Cavs cut the Bulls lead back to 85-76 in a getting nervous fourth quarter with eight minutes remaining, Augustin allowed Gibson to set a screen and then instead of making a fast move Augustin let Gibson clear and the defenders back off a bit and then went up for a three to put the Bulls back up double digits. The Cavs never got it back under again. The love is requited as this “man down” situation would be funny if it weren’t so sad. There’ll be plenty of talk about Augustin staying in the first 46 minutes. But the team doesn’t play again until Christmas Day, Wednesday. And it’s not like there were many other options for Thibodeau. Teague did play 12 minutes and even hit a pull up three. But he was too often shaky. Nazr Mohammed had one of his best sequences of the season with six points and two rebounds in 6:31, four of those minutes to open the second quarter when it was Nasty Time again with a jumper and a pair of free throws and a nice defensive stop. But he’s not a point guard. Only Erik Murphy basically didn’t play. And the Bulls surely needed this one after four straight losses and seven in the last eight and the training room overflowing by the day. This time the Bulls did and pretty much controlled the entire game, a rarity of late, with a strong start and never giving up the lead, good defense in the post and closeouts with extra emphasis on Bynum and Irving, better ball and player movement, which finally opened the floor a bit. The Bulls got rolling early behind Boozer with 11 first quarter points. But you also could see the change in spirit and speed, Snell with a three off an Augustin drive-and-kick, Noah working beautifully slashing off Boozer passes from the post and Augustin with a nice stroke of his own. The Bulls scored 33 points, which lately has been a first half goal and led 33-26 after one quarter. Thibodeau moaned again some about the turnovers, this time 21 for 17 Cavs points. Augustin had five for the second straight game. But there are no perfect games and no point putting the offense in a straight jacket again. Let him make the turnovers. When you speed the pace of play it’s inevitable. And OK.
Want to know who led the league in turnovers in 1989-90? Isiah Thomas. How about 1990-91? Magic Johnson. How about 1991-92? John Stockton. You want to know some of the season leaders since 2000? Steve Nash twice and Jason Kidd. The point is there is no one perfect in sports. But if you want to make plays you have to take chances. Sometimes you make a mistake. Don’t worry. Because when you try you have a chance to succeed. The problem with the Bulls offense is too often they are trying to be too perfect and too careful and trying to follow the right play down to the last detail. That’s not basketball. It’s not sports, really. You have to play the game. The Bulls need to play it faster, and they finally did Saturday. It was even nicer to watch for a change. After the Nazr nourishment, the Cavs got within 43-39. But Augustin came up with a three as he was four of six in the game. The Bulls aren’t going to shoot like that often. But they will make more threes playing faster and spreading the court, which doesn’t allow the defense to set as quickly and then chase out to the shooters. The Bulls will play to the inside more. But if the defense has to hesitate knowing the Bulls actually will take and make some threes, then those driving lanes are open as well for those slashing moves like Noah completed. The Bulls opened up the game with a 14-2 run to close the second quarter that included that Teague three without hesitation, Boozer and Noah playing cleverly together and Mike Dunleavy closing it with a long bounce pass to Noah for a dunk and 60-43 halftime lead. The Bulls are a good passing team. But with the defense collapsing so much in previous games they couldn’t get those passes through. Playing faster and shooting opened the court enough. The third quarter looked shaky again. Boozer had a pair of hard drives for scores early and then there was that Augustin three before a Snell session. The rookie is a good shooter and willing teammate. If you watch the bench you’ll see him leaping for hoped for joy as just about every three is shot. But it’s clear he needs to be still to shoot his three. He’s been able to drive and make plays. He doesn’t shoot well off the dribble. Though he seems to like to. But when he sets his feet he might be the team’s best shooter despite that high arcing three. He had a wild sequence late in the third with the Cavs hanging in down 73-65 with three minutes left. First Snell got deep into the lane and suddenly handed back to an alert Gibson for a short leaner for a 75-65 Bulls lead. After a Cavs miss, Snell took a handoff and hesitated, finally throwing to Noah, who was by then going in for the potential rebound, with three seconds on the shot clock. The ball eventually bounced back to Snell, who threw up a wild shot. Noah got it back and Snell positioned himself on top and got a pass back for a three and 78-65 Bulls lead. Bynum then missed as Gibson was good with late help. Augustin then found Snell in the same spot for another three as the Bulls led 81-65 after three. The Cavs threatened briefly in the fourth before those Augustin and Snell threes effectively ended it.